Lake Erie College of Osteopathic Medicine (LECOM) graduates Arthur De Luigi, DO, and Brian Juriga, DO, experienced the thrill of a lifetime when they served as part of the medical staff for the United States during the Sochi 2014 Paralympic Winter Games, the multisport competition for athletes with disabilities. 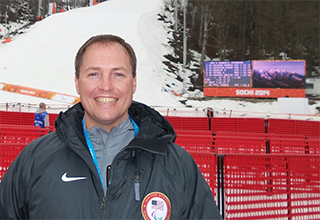 Dr. De Luigi served as head team physician and medical director for the U.S. Paralympic Alpine Ski and Para-Snowboarding teams, and Dr. Juriga served as a physician for both teams. Dr. De Luigi and Dr. Juriga, longtime friends and roommates while they attended LECOM, were stationed at Rosa Khutor Alpine Resort in Krasnodar Krai, Russia. The United States sent about 30 alpine skiers and 10 snowboarders to the Paralympic Winter Games. Dr. De Luigi, a 2001 LECOM graduate, and Dr. Juriga, Class of 2002, were in Sochi for almost four weeks and typically began their workday as early as 4:30 a.m. Despite the long hours, travel, and extended time away from their families and their medical practices, they are grateful for an opportunity many physicians can only aspire to. Dr. De Luigi and Dr. Juriga had worked with the United States Skiing & Snowboarding Association (USSA) in prior international competitions. The 2014 games were their first time serving on the medical staff for the United States in the Paralympics, however. They both had had to be approved by the United States Olympic Committee (USOC).